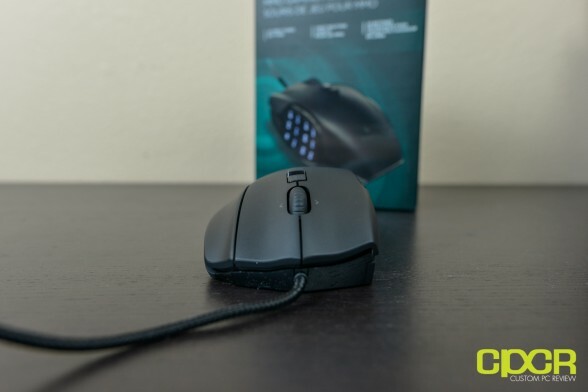 A couple of years back when Razer introduced the Naga MMO gaming mouse, it seemed like gamers from all over the globe were clamoring for the new mouse. At the time, it was possibly the first of its kind to grace the market. It had tons of buttons, lights, and it was geared towards the rapidly expanding MMO market which had been on the rise due to Blizzard’s ever so popular World of Warcraft. 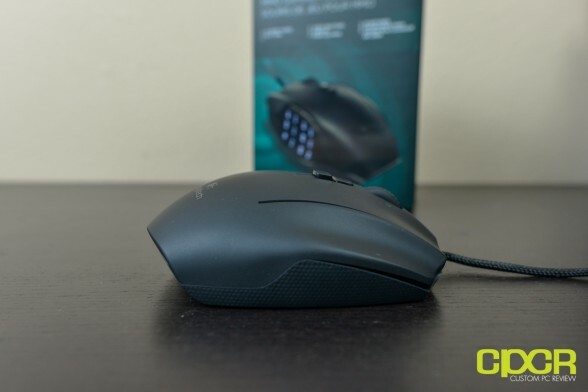 Since then, Razer has gone on to produce a couple iterations of their Naga gaming mouse such as the wireless Naga Epic as well as the fewer buttoned Naga Hex. Of course, whenever other companies see the popularity and potential of a certain product, they begin to chime in and create their own iterations. Today, we’ll be taking a look at one of the entrants into this growing market of gaming peripherals. Enter the G600 MMO gaming mouse designed by veteran gaming peripherals manufacturer, Logitech. 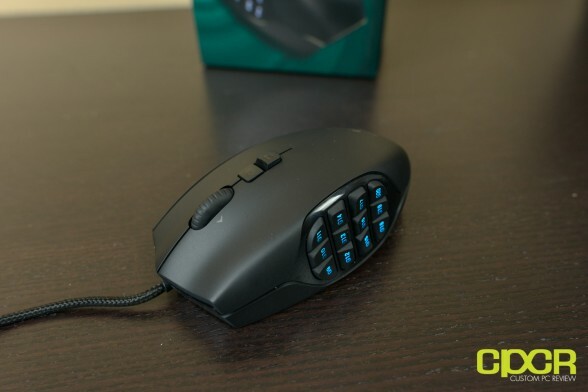 As its name suggests, it’s a mouse designed primarily for MMO gaming and follows the Razer Naga tons of side macro button type of design which means there’s a full 12 physical macro buttons on the left side alone. 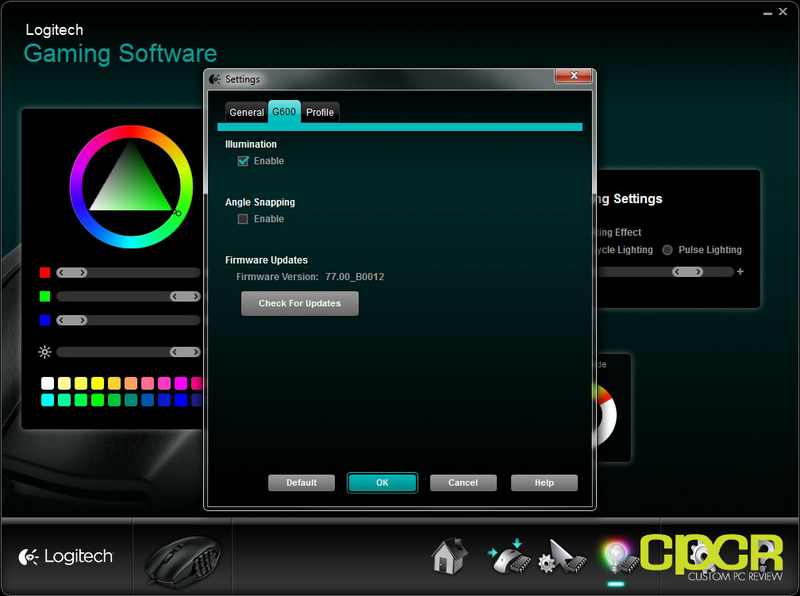 This will allow plenty of room for macros to be programmed and more. Is this new offering from Logitech too little too late? Let’s find out! 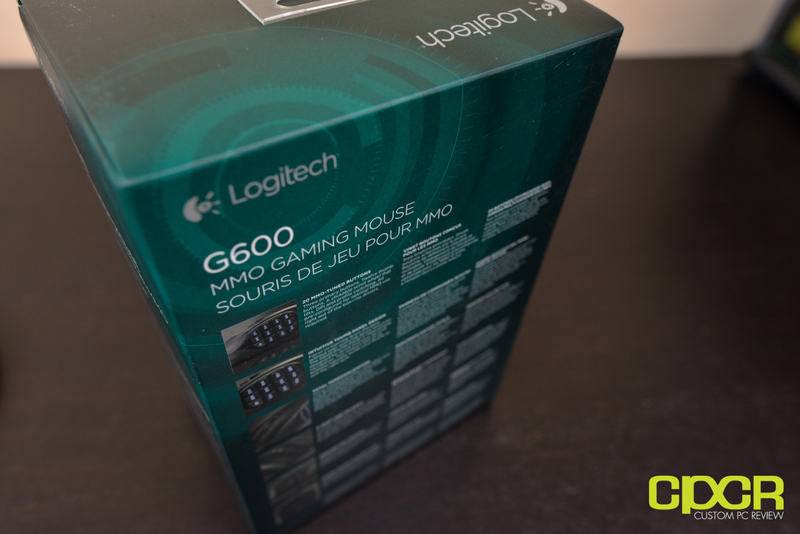 Let’s take a look at the Logitech G600’s packaging. The mouse is enclosed in a sturdy green cardboard box, similar to what most Logitech gaming mice come in. 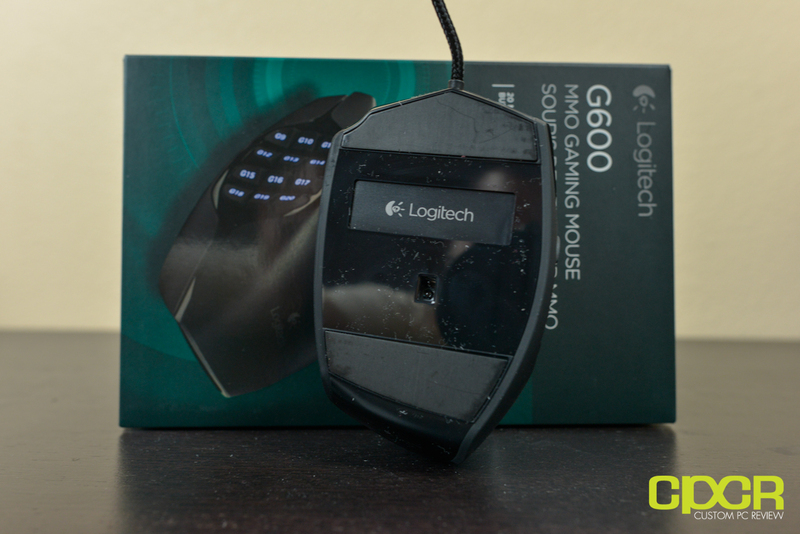 Like many gaming peripherals these days, the Logitech G600 doesn’t come with a lot of stuff. 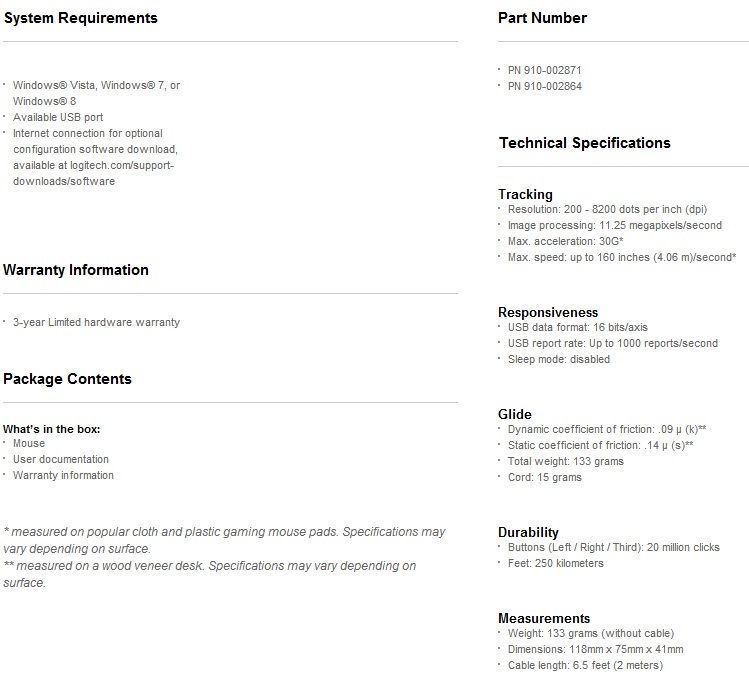 The only accessories included in the box is a couple pieces of documentation. Be sure to visit Logitech’s website for the latest drivers and software. Let’s take a quick look at the top of the mouse. 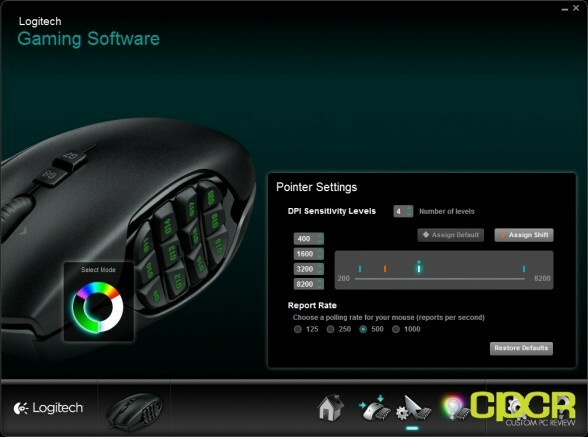 Unlike most mice out there, the Logitech G600 has three main buttons at the top – right click, left click, and G-Shift. Additionally, the mouse also has two buttons in the middle which may be used to switch modes, DPI, or programmed to whatever you like. There’s also a scroll wheel at the center which allows for left and right side clicking. In stock mode, clicking to the left gives you back (page) while clicking to the right gives you forward (page). 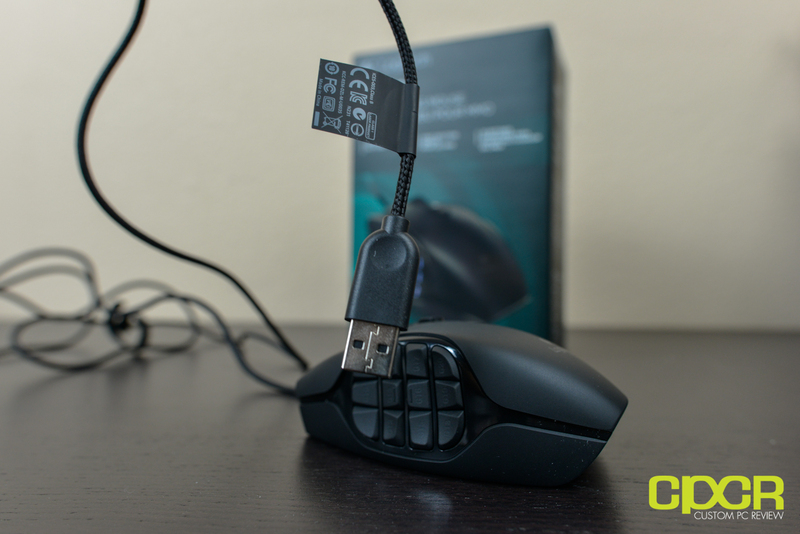 The Logitech G600 also comes with a 6.5ft long braided cable which ends in a standard USB connector. Logitech has also included a velcro strap mid-cable for managing the cable. Here’s a look at the left side of the mouse. There are twelve buttons here. Notice how the twelve buttons are arranged into two groups of six. The G13 and G16 buttons in the center of the mouse also have little bars which indicate where your thumb is. This makes locating buttons quite easy. The buttons here are quite mushy, wobbly, and aren’t nice and clicky like the top three. Here’s a look at the back of the mouse. Logitech has given the mouse a tapered design so the bottom of the mouse actually folds upwards to meet the top of the mouse. It also has a nice glossy finish as well. We also get a G600 logo printed on the glossy finish. It’s a bit difficult to see in the picture though. Here’s a look at the front of the mouse. It’s definitely going to be a palm grip mouse as it’s extremely wide with its three main buttons up top. 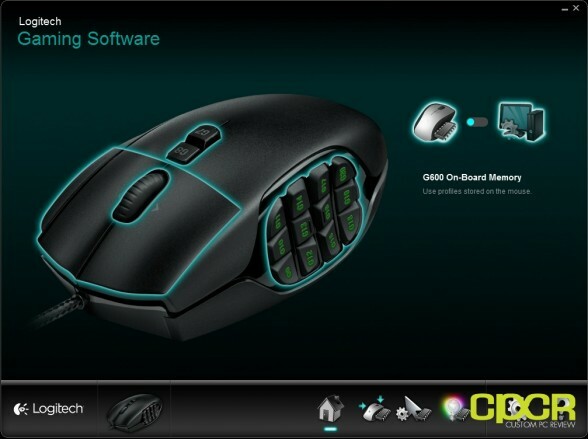 Here’s the ride side of the mouse with a better look at the G-Shift button. 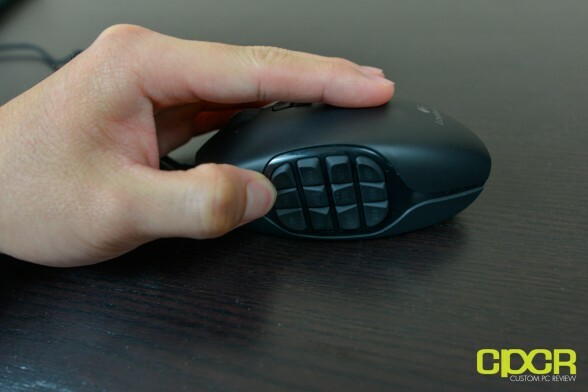 This button is meant to be operated by the ring finger while the pinky finger is supposed to hang off the side of the mouse. Here’s a look at the bottom of the mouse as well. Notice the main portion of the body at the bottom is glossy and there’s no information about the mouse down here. Be sure not to lose the box! In the center there’s the center along with a Logitech logo. At the front and rear there are two large teflon feet. 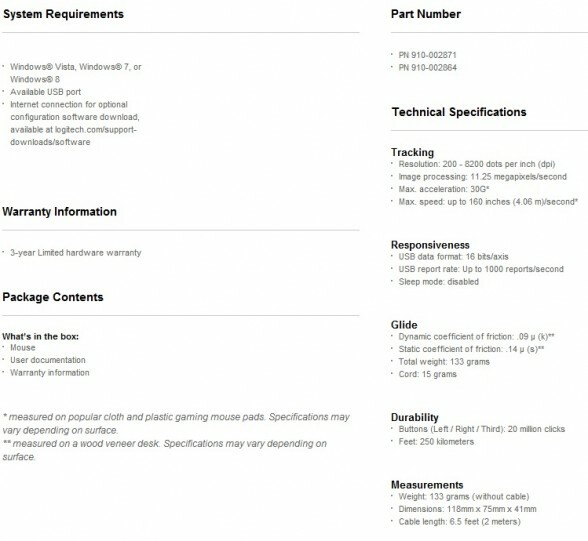 Additionally, the back of the mouse is tapered (rounded). Ok so onto installation. Simply plug the mouse into the USB port, download the software, fire it up, and you’re good to go. It’s pretty easy. Once plugged in, the mouse’s left buttons will light up. That’s the only part of the mouse capable of lighting up. Firing up the software, the first thing we get is a huge picture of the mouse with all the buttons highlighted suggesting you click on it and begin making button assignments. At the bottom right we also get a graphical menu for changing button assignments, changing lighting, help, etc. Here’s a look into button assignments. As you can see, there’s three quick switch modes (modes can be cycled via a button on the mouse if it’s programmed to do so) available to the mouse so you can set different button assignments for each mode. On the left is a shot of the command editor, which is used for programming buttons. If the right button on the mouse isn’t used for DPI shifting (shifting the DPI while the button is held), the button may also be used to double the amount of macros available by holding the button plus one of the macro keys on the left (or any button on the mouse for that matter). This gives the user up to 24 macro assignments on the left macro keys alone! Not to mention the left and right click buttons, wheel, and the middle buttons. Each mode can also have different DPI and polling rate assignments. Additionally, the G-Shift button on the right can be used to shift DPI which is useful for sniping in FPS games or moving sliders around in Photoshop. Here’s a look at the lighting menu. 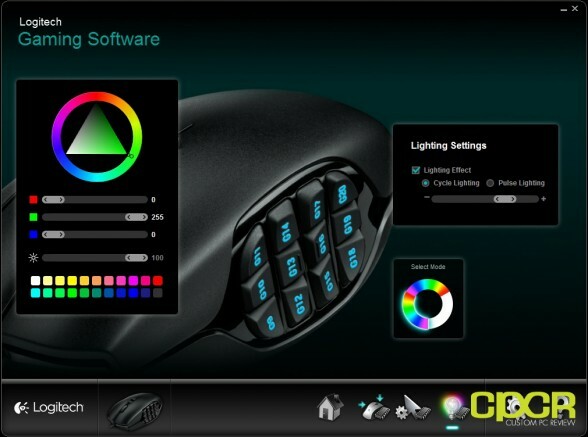 Since the G600 uses RGB style lighting, the color combinations range in the millions. You can also have the lighting set to pulse or cycle which is nice. The only part of the mouse that includes backlighting is the macro buttons on the left though. There’s also a settings menu which allows you to do a couple of the most important things as well. Here you can turn on/off illumination, angle snapping (prediction), and apply firmware updates. For general use, the Logitech G600 performed very well in many productivity applications. As you may have noticed through the macros menu, macros on the mouse may be set to save, open, new, etc. Modes can be swapped to use the mouse as a number pad so those with a tenkey-less keyboard will feel like nothing’s missing. You also get the DPI shifter on the right side which is great for making those ultra precise movements as well. That said, one thing I did notice is that it was very hard to make precise movements with higher DPI settings. For me, this is because I typically transition into a claw grip when I need to do that, but with the G600 being pretty much limited the the palm grip, I found it hard to really move the mouse where I wanted it. Although this mouse is meant for MMO games, I still ran the mouse through the usual gaming trio Battlefield 3, Diablo 3 and Counter Strike: Source to get a good feel of what this mouse is capable of in different genres of games. Starting with Battlefield 3, I felt like the mouse was a pretty good mouse for the job. The clicking on the mouse felt pretty good and since I’m a fan of heavier mice, the G600’s weight did feel better than other mice I’ve used. It did have DPI shifting as well, which is really nice for grabbing those headshots while sniping. Moving onto Diablo 3, I’d have to say the experience was just so-so. 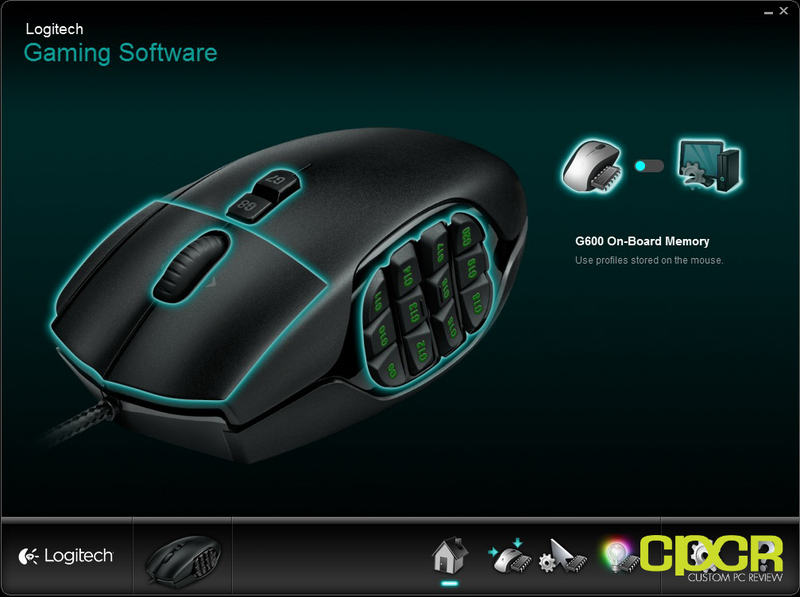 Diablo 3 requires a lot of clicking and I felt I wasn’t able to click as fast with the G600 as it was a palm grip mouse. I did map all the spells and potions to the macro buttons, but to be honest I didn’t use them all that much. Didn’t really find them any more convenient than hitting numbers 1-4. Might be good for other MMOs though that go all the way through 9 or something. Maybe set some auras and buffs to the macros and set the main attacks to the keyboard. Finally, I also tested the mouse in a couple games of fy_iceworld in CS: Source. 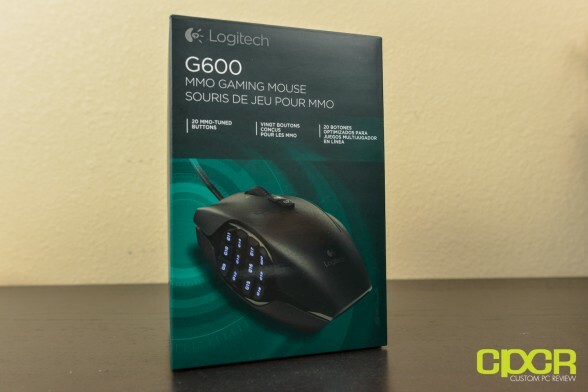 With CS, I’m a huge fan of using simple mice (maybe since I’ve been playing since the CS 1.3 days) and I felt that the G600 was simply too clunky for my tastes. I felt like I wasn’t twitching fast enough to get my shots and I’d end up getting taken out. Might just be me not being so used to the mouse, but I was doing significantly better on the Razer Taipan I reviewed a couple weeks back. Tracking was so-so and I definitely noticed some negative acceleration in game which threw me off a little. I’m pretty sure the mouse uses the new Avago ADNS-9800 series sensor, so it’s not too bad and I’ve been testing a lot of mice lately with Avago laser sensors, so I’m pretty used to having that acceleration. Truth be told, the triple button configuration and the forced palm grip was very uncomfortable for me as I’m very used to switching between the palm and the claw grips. Being forced into a certain grip just didn’t work out and I definitely felt some soreness on the wrist as well after using the mouse for a week. It might’ve just been my wrist adjusting to the mouse, but I’m not going to take it as a good sign. As for the G-Shift key, I found it quite uncomfortable to use for some reason; can’t pinpoint why but it might just be because I’m not too familiar with using the ring finger to hit a mouse button. I also had a pretty strange issue that I thing was throwing off my precision. Because of the mouse’s tapered backend (and possibly the small size of my hands), I found that the mouse’s frontend would liftoff – sorta like a wheelie. The picture above is an exaggeration of the issue, but it does lift of ever so slightly especially when making quick swipes upwards and upwards to the right. I did ask around our forums about this, but nobody else seemed to be having similar issues, so I’d say this is totally dependent on your hands and how you hold the mouse. Originally I had some pretty high hopes for the Logitech G600. I had been a huge fan of Logitech gaming mice over the years with the Logitech G500 still serving as my primary backup/test bench mouse. 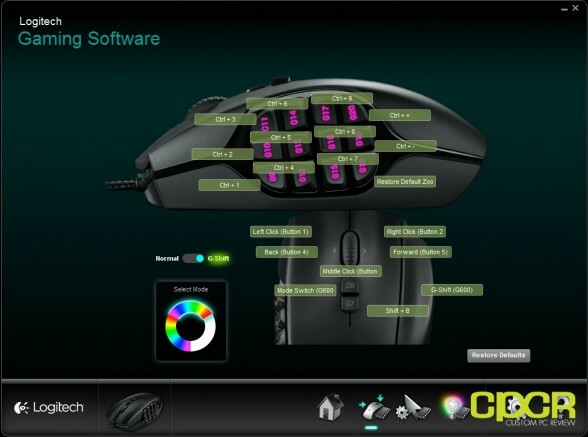 With the Logitech G600, well to be honest I’m not so sure about it. So, let’s go through my final thoughts about the mouse. Starting with appearance, I’d have to say the G600 does look pretty good. The LEDs on the left side are a good addition in order to help users get a bearing on their thumb’s location. 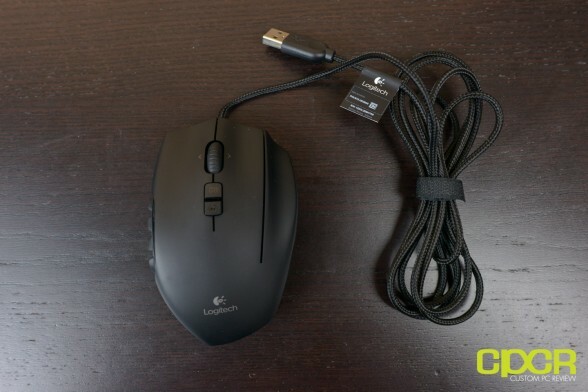 Logitech has done a good job with materials choice as well with the smooth plastic finish, but I would like to see a bit of rubbery, grippy material somewhere on the mouse – especially with a mouse so wide and difficult to grip. 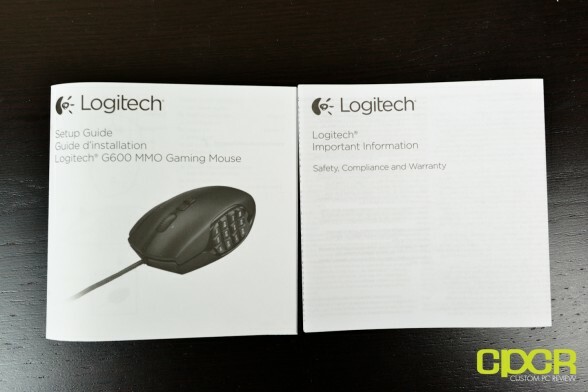 In terms of design, I think Logitech did drop the ball a bit here especially with that tapered design in the back. Personally, I had some issues with my mouse doing wheelies because of this which caused me to have some difficulty making precise clicks. I also had a bit of soreness in my right wrist as well after using the mouse for a week. 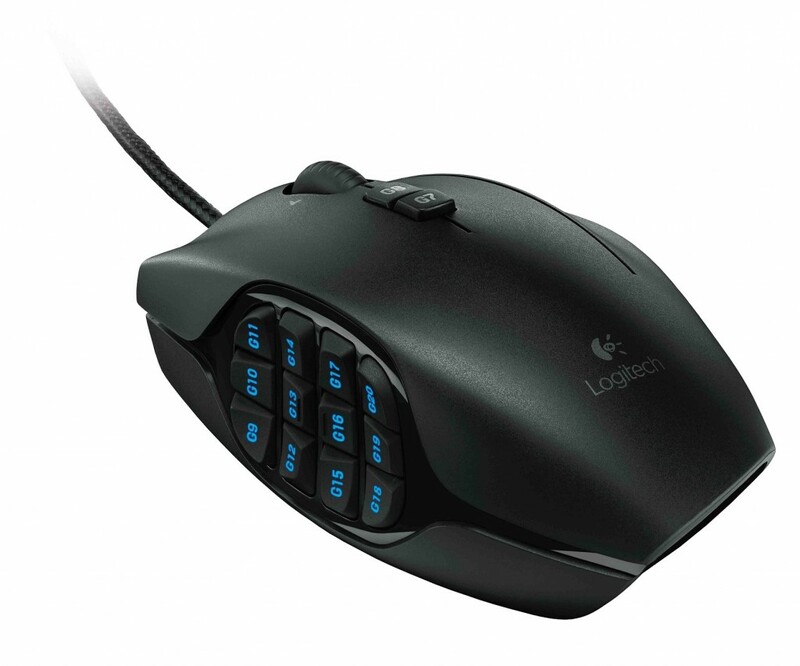 Logitech makes some pretty awesome ergonomic mice, but I think this isn’t one of them. As always with comfort, your mileage may vary. As far as the mouse’s performance, I didn’t have much issue at all. The mouse worked well for Battlefield 3 and the sensitivity shift third button was definitely good for making those precision snipes in game. Diablo 3 performance was acceptable as well. 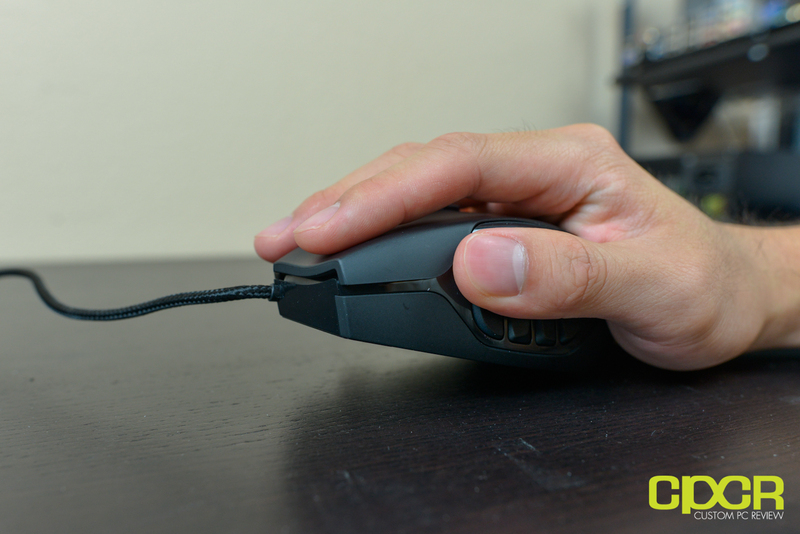 I would’ve preferred Logitech designing the mouse to work at least a little with the claw grip though. I found that my clicking speed was drastically reduced compared to the Razer Taipan, which I reviewed previously. 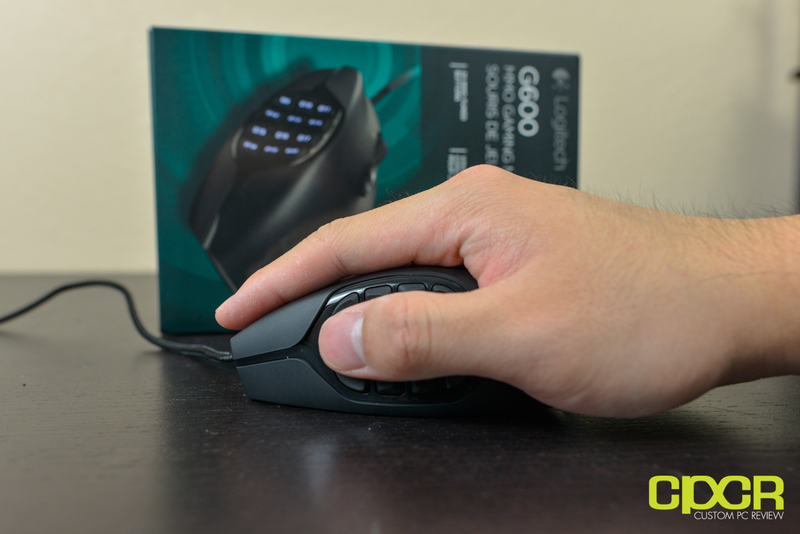 In terms of buttons, there’s no shortage with the G600 as well. The 12 macro keys on the left side give the G600 one of the most buttons of any mouse on the market, but to be honest, it was way overkill for what I was playing – Diablo 3. I can definitely see it being useful for casting auras and such in other MMOs where spells actually require numbers 1-9 instead of just 1-4. As mentioned previously, the number of buttons along with the capability of setting anything for the macros are also useful for productivity applications as well such as Excel, Photoshop, etc. Similar to many other newer mice I’ve reviewed such as the Razer Taipan and the CM Storm Sentinel Advance II, the Logitech G600 uses the Avago ADNS-9800 series sensor and overall I’ve been pretty happy with that new sensor. Definitely an improvement over the ADNS-9500, but in my experience there’s is a bit of negative acceleration. It’s not overwhelmingly bad on the ADNS-9800 series sensor, so it should be easy to adjust to. With most games these days natively featuring mouse acceleration in game (yes, even BF 3 and MW 3) I’m getting pretty used to the acceleration anyway – not that that’s a good thing… Those playing games that allow raw input such as CS, TF, L4D, etc. and are amazing twitch snipers though, you might want to avoid mice with acceleration as it may throw off your game. Pricing on the Logitech G600 is currently $79.99 on Amazon and the mouse comes in both the white edition and the black edition. 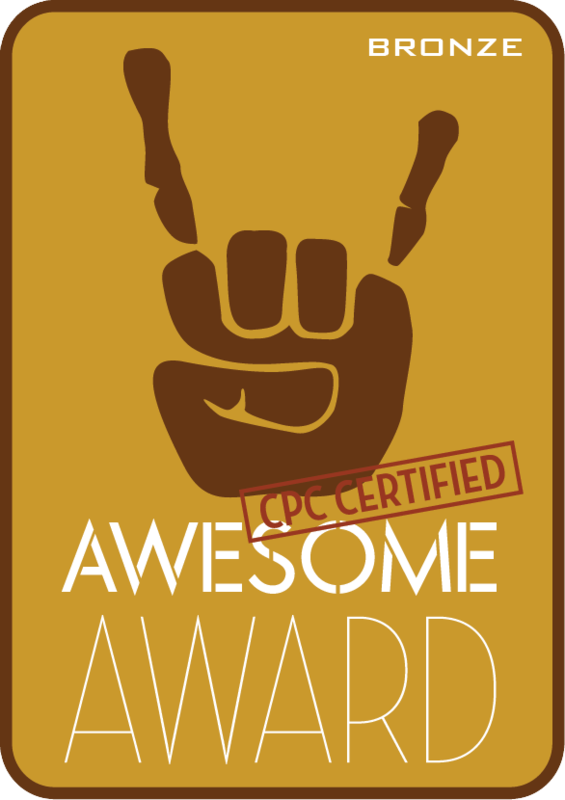 Competitors include the Razer Naga 2012($67.99), Corsair M90 ($64.99), and the Cyborg M.M.O.7 ($99.95). 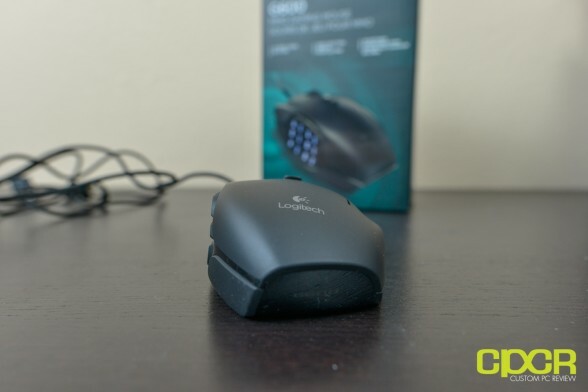 The Logitech G600 is a solid first entry by Logitech into the macro button heavy MMO mouse market – that is, if you find the mouse to be comfortable. I’d suggest saving your receipt on this one just in case. The Logitech G600 is currently available on Amazon in both the white edition and the black edition. Also, don’t forget to check out community member Xyriin’s Logitech G600 review as well. Testing a mmo mouse on BF3 and CS:S, really ? For precision testing i get it, but still… Of course the side buttons are useless in Diablo 3 since Blizzard made the game playable with 4-5 buttons on purpose. 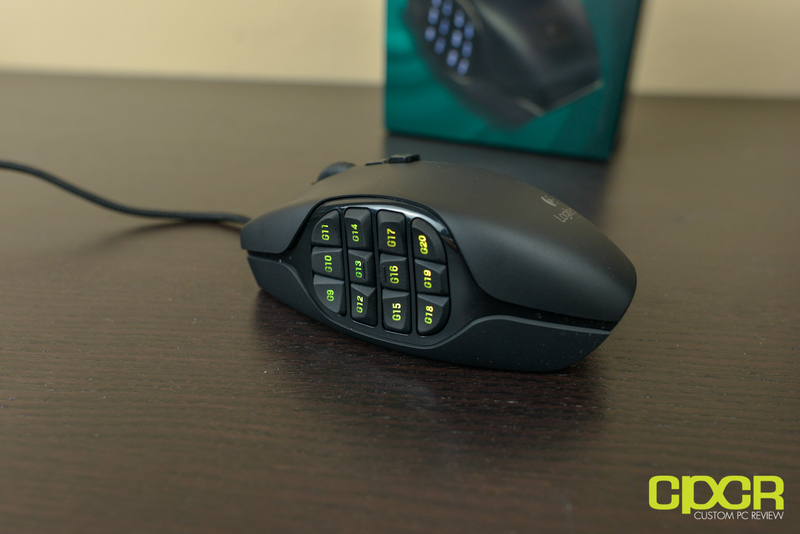 We’re talking about a mouse designed for mmo where you easily hit 20/30+ key binds. Back in WoW i had 30+, trust me i would have found a use of these side buttons. 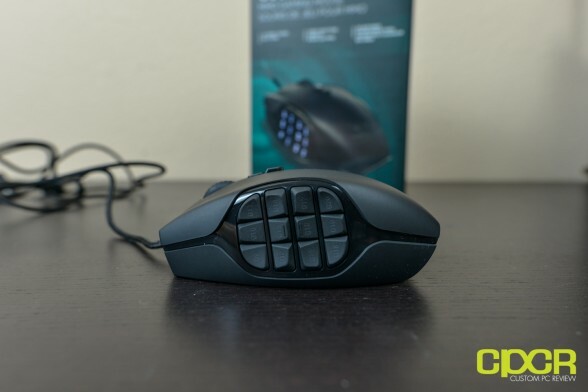 Interesting review tho, seems like this mouse isn’t for small hands, my big hands will probably love it.